To submit your work, please choose one of the following two methods. If you would like to have your boards printed and mounted in Detroit for your convenience, please choose this option. Please send your digital files and your inquiries (re: submission method, services, fee information) to Dunn Blue/ARC (submission location/contact info. provided below). To AIA participants: All of the AIA boards are produced on 3/16″ black gator with a matte laminate finish. We have been sending all of the borders with our local trucks down to the Detroit AIA house, so we will handle the delivery issues. If you could upload your files to our FTP site at http://www.dunnblue.com/services/connect_to_FTP. Please label the file and navigate to our Troy Location Upload folder. A short email with the file name and Company Contact information can be sent to michigan.color@e-arc.com. We will need to secure a credit-card to process this order, however we do not encourage sending credit card information via internet. Our billing department can be contacted directly at 248.288.5600 (You may ask for Dora or Denise they are both our in-house AIA event specialists). The boards are approximately $78.15 plus tax. If you have any questions please feel free to contact us directly. Can design save? It’s a loaded question, but the one we must ask. Even if we don’t set the parameters for what we are trying to save. In Detroit, the parameters aren’t the same as in other metropolitan areas. In some regards, we are light years behind the curve. In others, we have reached the pinnacles of advancement to the point that evolution is required if survival is in order. This is both a blessing and a curse. 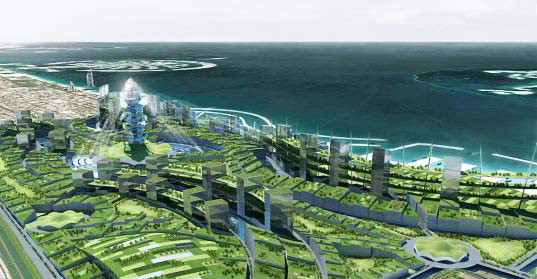 If you are an Urban Planner, Architect or Urban Designer you have probably had flights of fancy for Utopian city designs. 19th and 2oth century innovators have been theorizing the ideal city for over a hundred years. Stemming from sources such as Tony Garnier’s Une Cite Industrielle to Ebenezer Howard’s Garden Cities of To-morrow, Le Corbusier’s Ville Contemporaine even Frank Lloyd Wright’s Broadacre City, our modern built environment has become a constant experimentation in space and form. As with Detroit’s current state, this experimentation has been both a blessing and a curse. From segregated uses in zoning codes and mass suburbanization to crime ridden housing projects, the curse of implementing Utopian ideologies are often horrific as the realities of chaotic socio-economic factors undermine the best laid plans of mice and men. The resultant fields of architectural criticism and theory however offers us the blessing. Lessons learned, so to speak. From Lewis Mumford and Jane Jacobs to Aldo Rossi, Kenneth Frampton and even Rem Koolhaus, they offer the tools of being able to document and analyse the built environment. More importantly to the current efforts being addressed in Detroit, they offer us the insight to massive reorganization or rebuilding initiatives led by men such as Baron Georges-Eugène Haussmann, Daniel Burnham and Robert Moses. Moving forward, not only are fresh ideas needed for the design of Detroit, but a complete understanding of the history, successes and failures of the built environment. Humankind has over 10,000 years of precedent of how cities are organized and how they operate. Even though the Industrial Revolution changed everything and we have since been experimenting with the futures of our children, some things don’t change. If you are interested in submitting your work and ideas, don’t miss the February 14th registration deadline. First, let us welcome you to the American Institute of Architects (AIA) Detroit Chapter Urban Priority Committee’s (UPC) weblog for the 2011 Detroit: by Design symposium. Please join our forum and begin the conversation. The goal of The UPC of the American Institute of Architects Detroit chapter is to bring awareness to the design community and to promote its involvement in the planning and design of our city and region. We have a role in the design of our communities. We offer our participation and expertise in assisting our city in the historic process of re-shaping the City to achieve a sustainable community design. The proposed 2011 event is to help achieve this common goal, which we hope would assist the City in its historic efforts. Second, we would like to invite students, faculty, and professionals to submit design projects focusing on three themes – transportation, urban centers and urban agriculture – to address Detroit’s shrinkage and in re-organizing the City. We invite design or planning proposals that draw attention to the four month long symposia planned in Spring 2011; promote the importance of design when planning transportation, urban centers and urban agriculture in a leaner and greener Detroit; educate the design profession and the public about the importance of civic engagement in re-shaping Detroit; and raise awareness of issues that matter to a broad range of stakeholders who may be affected by the City’s new strategic framework planning. If you are interested in submitting your proposal, please download the registration form (click here), fill it out and send the completed form to UPC@aiadetroit.com.